1mm, 1.5mm, 2mm, 3mm, 4mm, 5mm and 6mm diameter 7x7 stainless steel wire rope available to buy on pre cut 100 metre and 250 metre reels. Ideal for applications where a continuous run of steel wire rope is required. 7x7 stainless steel wire rope available in trade value reels of 100 and 250 metres. 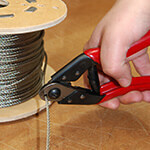 The ideal choice for applications where you need multiple lengths of wire - simply cut to the length required. 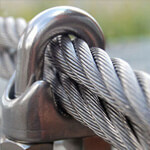 The 7x7 stainless steel wire rope is more flexible than 1x19 due to its construction but not as strong. 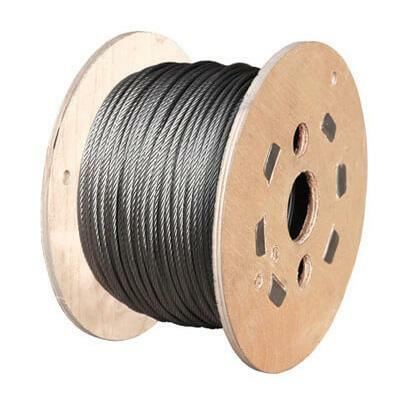 7x7 stainless steel cable is stronger than 7x19 rope, making it suitable for tensioning, security cables, marine, landscape and architectural applications, stainless cable balustrade, stainless steel cable railing and decorative use. Brilliant service yet again thankyou. Good quality and the cheapest I could find. As described and delivered promptly. 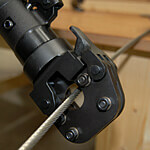 Great product, nice and flexible - always buy from this company. Love it! Easy to use and looks great close up and unobtrusive against brickwork from any more than a few feet away. does the job, only need a decent pair of cutters now!! Strong cable which I used for hanging an art installation. Exactly what I required. I was pleasantly surprised by the price. good quality but reel badly damaged : transport packing flimsy and inadequate.